The aircraft can be configured in a variety of ways, as a 19-seat passenger transport or corporate shuttle, a medium-range cargo transport, high-endurance sensor platform, medevac, maritime surveillance or border patrol aircraft. Ruag Aerospace Services is here at NBAA ‘11, exhibiting on the Henderson Executive Airport static display line with an example of something sort of old and something quite new, the “New Generation” Dornier DO 228NG multi-mission turboprop twin. Last year the aviation division of Swiss holding company Ruag began delivering new examples of the model first manufactured in 1981. Originally built as a regional airliner, its latest iteration is being marketed for several special missions with an all-glass cockpit, 715-shp flat-rated Honeywell TPE331-10 engines and five-blade propellers. First delivery of the newly built 228NG was in September 2010 to a Japanese operator. Current production rate at the Ruag final assembly facility in Oberpfaffenhofen, Germany, is four airframes per year. As with previously built DO 228s, fuselage, wing and tail sections are being built by Hindustan Aeronautics Ltd. (HAL) in India and shipped to Bavaria. Ruag’s Alexander Muller said Sunday that 28 percent of DO 228NG content is currently American–primarily engines and avionics–but may soon rise to as high as 50 percent. The aircraft can be configured in a variety of ways, as a 19-seat passenger transport or corporate shuttle, a medium-range cargo transport, high-endurance sensor platform, medevac, maritime surveillance or border patrol aircraft. A 78-knot stall speed gives the DO 228NG excellent short- and unprepared-field performance, with a balanced field length of just under 2,000 feet at max gross weight. 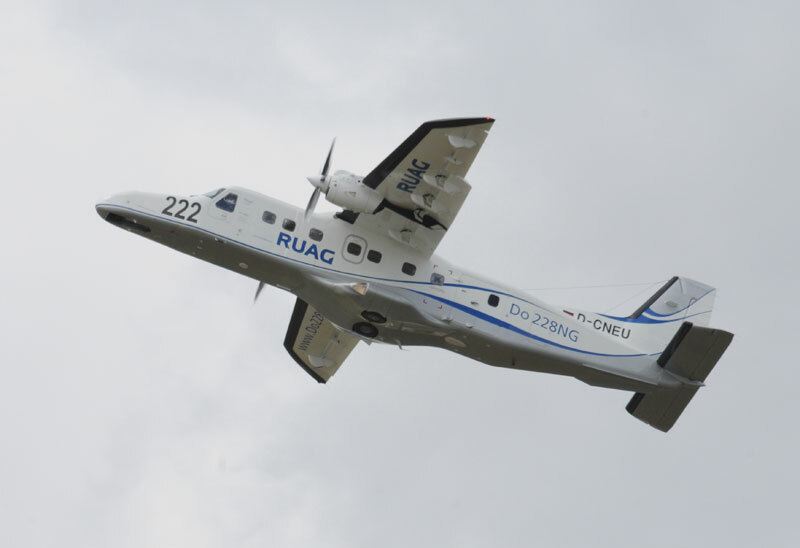 Ruag is willing to renovate and modify existing DO 228 airframes to NG configuration, but representatives said there are no such aircraft currently available. Approximately 250 DO 228s are flying worldwide today. The DO 228NG’s primary rivals in the special mission arena are the Czech-built LET 410 and deHavilland-Canada DHC-6 Twin Otter (now manufactured by Viking Aircraft). Ruag produced figures showing the -228 having better speed, range, payload and hourly operating cost numbers than those of competitors. Price of the new production D0 228NG varies widely depending upon the mission equipment specified, from a low end of $8.7 million to as high as $40.2 million. The aircraft’s utility and ease of mission equipment installation is enhanced by its slab-sided, unpressurized fuselage and large roller door that can be opened in flight. It will accommodate a wide variety of sensors including Flir, laser illuminator, 360-degree surveillance and side-looking radars. new Do228NG. Spec is passenger transport.